Now there is a long sleeve Christmas t-shirt that transforms you into a Christmas themed biker. The ugly Christmas sweater design looks more like a costume t-shirt. 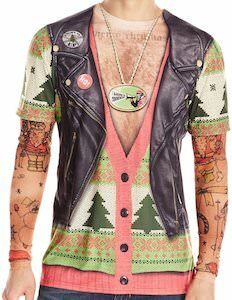 it all starts with the arms as they show tattoo’s all Christmas themed tattoos and yes there is chest hair to and a Christmas vest and a leather jacket that has Santa Claus on a motorbike on the back. All in all a crazy and fun long sleeve Christmas t-shirt that is perfect for wearing to the office Christmas party. You can get this Christmas shirt in men’s sizes Small – 2XL and this will get you noticed. Are you looking for that perfect shark t-shirt? How about this white t-shirt that comes in many styles, shapes and size. 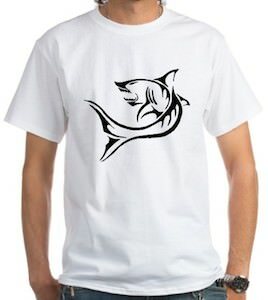 On this t-shirt you can see a shark swimming up at you and the shark is like a tattoo style drawing giving it a real special look that of course you want from all you t-shirt’s. Why be like all the other people when you can have something really special like this shark t-shirt. It doesn’t matter what time of year it is Tornado time, Shark Week time or even Christmas this shark t-shirt will be perfect for any occasion. 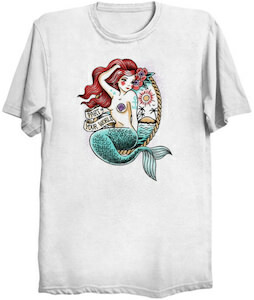 Get dressed in style with this Shark Tattoo T-Shirt. If dragons are you thing then you may like this t-shirt. 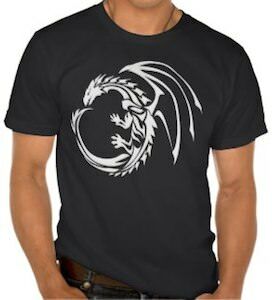 On this t-shirt you can see a tribal tattoo type dragon in white with big wings and a great shape this dragon looks good on any t-shirt. And yes you can get this t-shirt in different colors and it even comes in different styles for men and women. A t-shirt like this just looks great even if you just like the picture just wear that shirt and enjoy it. 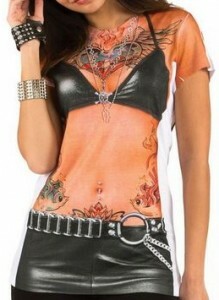 Come take a closer look at this Tribal Dragon Tattoo T-Shirt. The Gecko is cool and unique, so now it is time to get one on your t-shirt. On the front of this t-shirt is a Gecko that is designed as a tattoo, with fine details from the feet and claws to the striped tail this really looks amazing and stands out. Made from 100% cotton you can get this Gecko t-shirt in a huge variety of colors and sizes, also check out the many different types of shirts and hoodies to get your Gecko tattoo printed on. 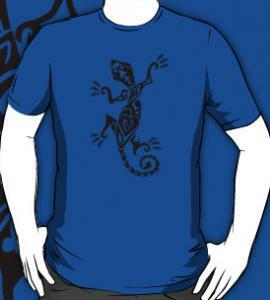 Take a closer look at this Gecko Tattoo T-Shirt. 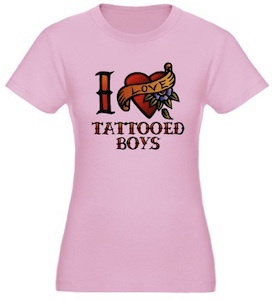 If you like tattoos and specially on the guys then maybe you should check out this “I Love Tattooed Boys” t-shirt. And you don’t have to get it in pink if you don’t want that color. 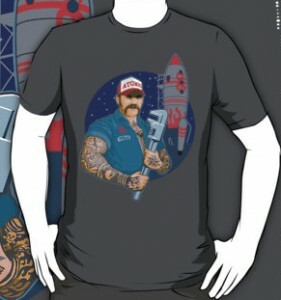 So tattoo fans go have a better look at this I Love Tattooed Boys T-Shirt.